CELEBRATE a 70th birthday! 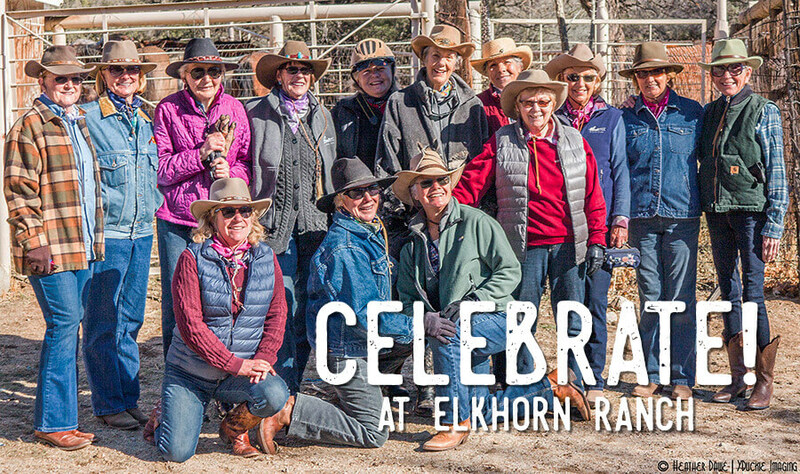 Start a new family tradition by bringing your kids or grandchildren to Elkhorn Ranch for spring break! Dude ranch life brings people together to enjoy friendship, outdoor adventure and relaxation! There are 20 cabins and each is different ~ so each guest party is carefully assigned to a cabin. Many people rebook as they leave, to assure that they’ll have their favorite cabin and be here with friends. Then we book reservations up to a year in advance. We hold the cabin for you after we correspond; and then we confirm the reservation upon receipt of your 25% deposit confirmation and registration form. We love old fashioned checks, but also work with VISA or MC. It’s that simple! A few cabins available for adult oriented weeks of February 3 – 10, February 10 – 27, and February 24 – March 3, 2019. February 17 – 24, 2019 ~ school holiday week is full. Call soon to reserve one of the few cabins open during adult oriented weeks of March 3 – 10 and March 10 – 17. If you enjoy kids or wish to avoid kids please be blunt ~ and we’ll steer you appropriately. Families will love the weeks of March 17 – 24 and March 24 – 31, 2019. Check your school calendar and call soon! So far, the weeks of March 31 – April 7, April 7 – 14, April 14 – 21 and April 21 – 28, 2019 are quite mixed with families and adults and multi-generational groups. We’ve got room for some groups and would love to hear from you to arrange a reunion of family or friends! November 17 – 24, 2019 ~ adult oriented, cabins available! Thanksgiving November 24 – December 1, 2019 ~ family oriented, with a few cabins open! Call Soon! Enjoy reduced winter quiet rates and an intimate adult oriented travel experience December 1 – 22, 2019 ~ plenty of availability. Holidays 2019/20 ~ Christmas December 22 (or earlier) – 29, 2019 has room; New Years week December 29 – January 5, 2020 has a few cabins open! We are taking reservations for fall 2019! Thanks to Elkhorn guest Heather Dawe for sharing photography!